Following Monday’s training session pre-Aberdeen loss, one player was conspicuous by his absence, and to the best of our knowledge, he’s technically available. Carlos Pena’s loan at Necaxa was terminated a month or so ago, and the Mexican international confirmed he’s returning to Scotland to fight for his place again. His appearance looked leaner, healthier, and he looked like he intended to give Rangers everything. However, he still, to the best of our knowledge, has not reappeared at Auchenhowie and with ongoing creativity issues in advanced midfield, would Steven Gerrard not be better off taking advantage of his availability at least until January when the window opens? Pena has shown fleeting glimpses of not only his technical competence, but his ability to score goals, and Lord knows Rangers need depth in that position. He cost then-manager Pedro Caixinha’s Rangers around £3.2M and frankly that is the kind of investment we need dividends from. If Carlos Pena is fit and available he really should come into contention. Otherwise the only option we seem to have for that position is Ovie Ejaria. And that won’t cut it, sorry. He's not available till January. He's our player and Nexaca terminated the loan early. if he's not available till January, can you explain why? Even if that is the case why is he not training with the squad if he is back in Scotland ? Didn't know that Tony. Thought they had cut his loan short. As we own him, why can't he play for us? take your word for it though. 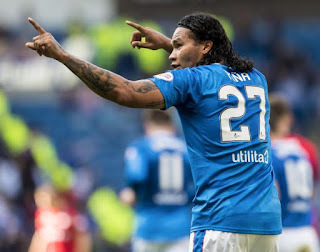 When Arfields not there we need to change the system a wee bit,two holders Jack and McCrorie and 3 attackers behind the main striker .I would play Middleton ( or Kent if he is fit)off the main striker with Candeias and Grezda on the wings .We don`t need Pena thats for sure. I think your forgetting just how bad Pena was. Sure he scored a couple of goals but he literally did nothing else. Pena was as good as 2 men missing and obviously didn't improve much after returning to Mexico. He's not good enough to get a game for Nexaca who are 3rd bottom in the Mexican league and deep in their relegation zone. And as mentioned before his behaviour with the shorts was a total unacceptable insult to the club. Nobody can come back from that. It was a bad and costly mistake but this man should never even darken the doors of The Hummel Training Centre again never mind Ibrox. Just get rid! Recoup our losses. Don't waste our time and energy, on him. About as mad as the constant insinuations that Joe Dodoo, should get a place. What's with giving 'crocks' a second, third and fourth, chance? ?